PERSONAL DATA: Born November 5, 1961 in Pasadena, California. Considers Rockville, Maryland, to be his hometown. Married to the former Lisa A. Pfeiffer of Gulf Breeze, Florida. They have two children. Recreational interests include motorcycling, running, weight lifting, boating, hunting and fishing. EDUCATION: Graduated from Coronado High School, Coronado, California in 1979. Graduated with highest honors from Georgia Institute of Technology with a bachelor of aerospace engineering degree in 1986 and a master of science in aeronautical engineering from the Naval Postgraduate School in 1995. ORGANIZATIONS: Society of Experimental Test Pilots, Association of Space Explorers. AWARDS: Defense Meritorious Service Medal, NASA Aviation Safety Award, Navy and Marine Corps Commendation Medal with Combat V, Navy and Marine Corps Achievement Medal, various other service awards. EXPERIENCE: Poindexter was commissioned following graduation from the Georgia Institute of Technology in 1986. After a short tour of duty at the Hypervelocity Wind Tunnel Facility, Naval Surface Weapons Center, White Oak, Maryland, Poindexter reported for flight training in Pensacola, Florida. He was designated a Naval Aviator in 1988 and reported to Fighter Squadron 124, Naval Air Station Miramar, California, for transition to the F-14 Tomcat. Following his initial training, Poindexter was assigned to Fighter Squadron 211, also at Miramar, and made two deployments to the Arabian Gulf during Operations Desert Storm and Southern Watch. During his second deployment in 1993, he was selected to attend the Naval Postgraduate School/U.S. Naval Test Pilot School Cooperative Program. Following graduation in December 1995, Poindexter was assigned as a Test Pilot and Project Officer at the Naval Strike Aircraft Test Squadron (NSATS), Naval Air Station (NAS) Patuxent River, Maryland. Following his tour at Patuxent River, Poindexter reported to Fighter Squadron 32, NAS Oceana, Virginia, where he was serving as a department head when he was selected for Astronaut training. After his retirement from NASA, Poindexter returned to the Navy. Poindexter has more than 4000 hours in more than 30 aircraft types and has logged more than 450 carrier landings. NASA EXPERIENCE: Selected by NASA in June 1998, he reported for training in August 1998. Initially, Poindexter served in the Astronaut Office Shuttle Operations Branch performing duties as the lead support astronaut at Kennedy Space Center. He served as a CAPCOM for several missions and is veteran of two space flights. Captain Poindexter has logged more than 669 hours in space. 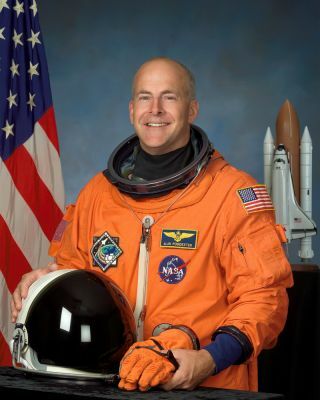 In 2008, he served as Pilot on STS-122, and in 2010 was the Commander of STS-131. Captain Poindexter retired from NASA in December 2010. SPACE FLIGHT EXPERIENCE: STS-122 aboard Atlantis (February 7-20, 2008) was the 24th Shuttle mission to visit the International Space Station. Mission highlight was the delivery and installation of the European Space Agency’s Columbus Laboratory. It took three spacewalks by crewmembers to prepare the Columbus Laboratory for its scientific work, and to replace an expended nitrogen tank on the Station’s P-1 Truss. STS-122 was also a crew replacement mission, delivering Expedition-16 Flight Engineer, ESA Astronaut Léopold Eyharts, and returning home with Expedition-16 Flight Engineer, NASA Astronaut Daniel Tani. The STS-122 mission was accomplished in 12 days, 18 hours, 21 minutes and 40 seconds, and traveled 5,296,832 statute miles in 203 Earth orbits. STS-131 aboard Discovery (April 5-20, 2010), a resupply mission to the International Space Station (ISS), launched just before dawn from the Kennedy Space Center. Upon arrival at the station, Discovery’s crew performed three spacewalks to replace an empty ammonia tank for the ISS Thermal Control System. They also transferred more than 13,000 pounds of hardware, supplies and equipment. Included in the transfer, were a new crew sleeping quarters, and three scientific experiment racks. On the return journey the MPLM (Leonardo Multi-Purpose Logistics Module) inside Discovery’s payload bay was packed with over 6,000 pounds of hardware, and scientific and technical research return samples. The STS-131 mission lasted 15 days, 02 hours, 47 minutes, 10 seconds, and traveled 6,232,235 statute miles in 238 Earth orbits.